Dell was born in Dubuque, Iowa where he spent most of his young adult life as a lineman, construction worker, and owner of one of the first television repair shops. In 1951, he married Regina (Jean) Winders. He also served in the United States Air Force during the Korean War. After the War, Judge Dell enrolled in Lo- ras College where he earned a B.A. in Business Administration in 1958. Judge Dell graduated from law school at the University of Notre Dame, earning an LLB and a JD in 1962. After graduation from Notre Dame, the young Dell and his wife Jean moved to West Palm Beach, where they became active parishioners in St. Juliana’s Church. 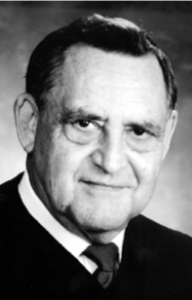 Judge Dell began his legal career as an associate and later a partner at Miller, Cone, Owen, Wagner and Nugent (1962-71). In 1971, he joined Dell, Smith and Casey, P.A. as a named partner, and he remained there until 1981. In 1981, then Governor Bob Graham appointed Judge Dell to the Fourth District Court of Appeal where he remained for 20 years, presiding as Chief Justice from 1993-95. During his time on the bench, Judge Dell remained active in the legal community. He served on the Florida Supreme Court Judicial Ethics Advisory Committee from 1983-99; the Florida Conference of District Court of Appeal Judges as president from 1993-94; the Conference of Appellate Judges Executive Committee from 1992-94; the Judicial Management Council of Florida from 1995-98; and he served on numerous Florida Bar Committees including the Grievance, the Rules of Judicial Administration, and the Appellate Rules Committees. Judge Dell was also active in his local Palm Beach County Bar Association, serving on the Medical Legal Committee from 1967-69; the Circuit Court Advisory Committee from 1969-81 (chair 1972- 81); the Committee for the Needs of Children (chair 1984-86); and the Historical Committee. In 1981, Judge Dell was recognized as Man of the Year by the Notre Dame Club of Palm Beach County. And in 1986, he received the Msgr. Jeremiah P. Mahoney Award for Outstanding Catholic Lawyer for his service to the community, bar, and judiciary. Judge Dell worked and played hard his entire life. He loved driving home to visit friends and family. His friends and neighbors could always count on his help, particularly when it came to home and yard maintenance. He was always available to his colleagues when asked for his opinions and guidance. In later years, he enjoyed playing cards and visiting his extended family in Dubuque. He was a caring and devoted husband, father, grand- father, brother, and uncle. He will be remembered for his honesty, dedication, and commitment as an attorney and appellate court judge. Judge Dell joins his beloved wife and soul mate of fifty-nine years, Jean Winders Dell; his parents, John Dell and Ethel Grimmell Keller; and sisters, Shirley (Keller) Mehrl and Judy (Keller) Mueller. He is survived by four children: Deborah, Steven (wife Pamela), Douglas, and Gina, along with three grandchildren: Steven II (wife J’aime), Brent (wife Stephanie), and Jacob. Judge Dell is also survived by a large extended family including three brothers: Richard Keller, Ernest (Butch) Keller, Kenneth Keller and their wives; his in-laws: Nick Mueller and Joseph Olinger, and numerous nieces and nephews, many of whom were frequently by his side since the loss of his beloved “Mrs.” in 2010. Do- nations can be made in Judge Dell’s memory to the Sorin Society of the University of Notre Dame, Donor Ser- vices, Attention: Carol Hennion, 1100 Grace Hall, Notre Dame, IN 46656.